Director/Screenplay – David Koepp, Based on the Novella Secret Window, Secret Garden by Stephen King, Producer – Gavin Polone, Photography – Fred Murphy, Music – Philip Glass, Additional Music – Geoff Zanelli, Visual Effects – Gray Matter FX (Supervisor – Gray Marshall), Special Effects Supervisor – Louis Craig, Production Design – Howard Cummings. Production Company – Pariah. Morton Rainey is a best-selling novelist. He is living alone in a cabin in the woods following the break-up of his marriage. He is suddenly interrupted by the arrival of a stranger John Shooter who insists that Mort stole his short story ‘Sowing Season’ and published it under the title ‘Secret Window’. Shooter shows Mort the manuscript, which is identical, word for word. Mort dismisses Shooter but Shooter proves insistent and then turns violent, killing Mort’s dog, torching his wife’s house and killing witnesses that get in the way. David Koepp has a reputation as one of Hollywood’s top screenwriters, having turned out scripts for thrillers like Bad Influence (1989), Carlito’s Way (1993), Mission: Impossible (1996), Snake Eyes (1998), Panic Room (2002) and Jack Ryan: Shadow Recruit (2014), as well as a considerable number of genre films – Apartment Zero (1988), Death Becomes Her (1992), Jurassic Park (1993), The Shadow (1994), The Lost World: Jurassic Park (1997), Spider-Man (2002), War of the Worlds (2005), Zathura: A Space Adventure (2005), Indiana Jones and the Kingdom of the Crystal Skull (2008), Angels & Demons (2009), Inferno (2016) and The Mummy (2017). David Koepp’s best work however is usually when he turns director himself, something that one wishes he would do more often. Koepp first appeared in the director’s chair with The Trigger Effect (1996), an intelligent film that subtly dealt with the prejudices that might emerge with the downfall of civilised order, followed by the excellent medium thriller Stir of Echoes (1999). Secret Window was his third directorial outing and Koepp subsequently went onto the comedy Ghost Town (2008), the thriller Premium Rush (2012) and the comedy Mortdecai (2015). Here David Koepp adapts a 1989 novella by Stephen King. Koepp does a fine job with both the adaptation and in drawing out the suspense – the film sits in an ambiguous netherworld where Koepp leaves us uncertain as to who or what John Turturro’s sinister farmer is. Some audiences and critics were unkind to Secret Window, dismissing it as hackneyed and/or not generating much in the way of suspense. David Koepp never quite creates something as genuinely eerie as he did with Stir of Echoes but Secret Window nevertheless keeps one enrapt. It is largely a film where Koepp requires a degree of intelligence from an audience and that one bear with his suspense tactics, which are often more subtle and slower than multiplex crowds are used to. There is also his twist ending [SPOILER ALERT] – here Secret Window comes out a cross between a previous Stephen King adaptation The Dark Half (1993), which starred Timothy Hutton as a writer haunted by an evil doppelganger, and Fight Club (1999). The measure of whether this is a surprise that has lost its familiarity or is an effective shock is a debatable one – one was able to predict where the film was going, nevertheless David Koepp delivered it with a fair degree of effectiveness. 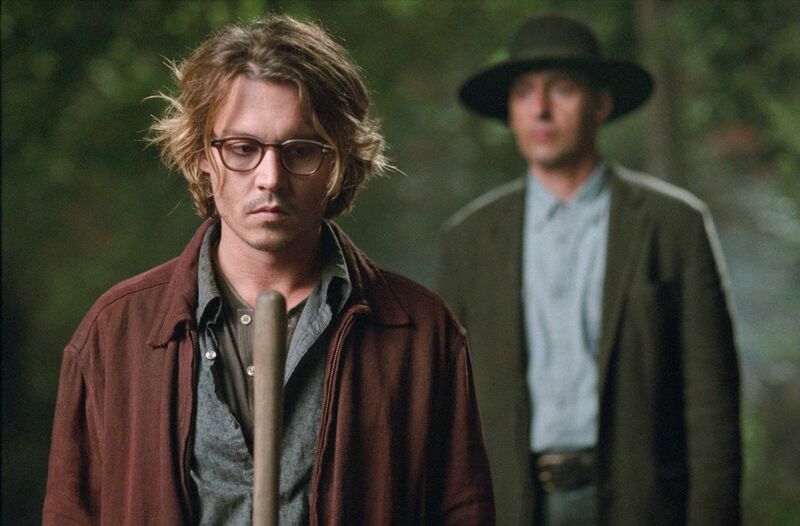 Secret Window was promoted largely as a Johnny Depp film. The release schedule was even pushed up by several months to take advantage of Johnny Depp’s Academy Award nomination for Pirates of the Caribbean: Curse of the Black Pearl (2003). Johnny Depp does well with the role, even if one suspects it was a part suited to a slightly older actor. In the end, it is not a role that ever stands among Johnny Depp’s greatest performances, certainly not up there with his roles in Edward Scissorhands (1990), Ed Wood (1994), Don Juan de Marco (1995) or Pirates of the Caribbean. The one standout performance though comes from John Turturro whose measuredly polite backwoods accent and yet perfectly deadly matter-of-fact intonation is marvellously chilling. Other Stephen King genre adaptations include:- Carrie (1976), Salem’s Lot (1979), The Shining (1980), Christine (1983), Cujo (1983), The Dead Zone (1983), Children of the Corn (1984), Firestarter (1984), Cat’s Eye (1985), Silver Bullet (1985), The Running Man (1987), Pet Sematary (1989), Graveyard Shift (1990), It (tv mini-series, 1990), Misery (1990), a segment of Tales from the Darkside: The Movie (1990), Sometimes They Come Back (1991), The Lawnmower Man (1992), The Dark Half (1993), Needful Things (1993), The Tommyknockers (tv mini-series, 1993), The Stand (tv mini-series, 1994), The Langoliers (tv mini-series, 1995), The Mangler (1995), Thinner (1996), The Night Flier (1997), Quicksilver Highway (1997), The Shining (tv mini-series, 1997), Trucks (1997), Apt Pupil (1998), The Green Mile (1999), The Dead Zone (tv series, 2001-2), Hearts in Atlantis (2001), Carrie (tv mini-series, 2002), Dreamcatcher (2003), Riding the Bullet (2004), ‘Salem’s Lot (tv mini-series, 2004), Desperation (tv mini-series, 2006), Nightmares & Dreamscapes: From the Stories of Stephen King (tv mini-series, 2006), 1408 (2007), The Mist (2007), Children of the Corn (2009), Everything’s Eventual (2009), the tv series Haven (2010-5), Bag of Bones (tv mini-series, 2011), Carrie (2013), Under the Dome (tv series, 2013-5), Big Driver (2014), A Good Marriage (2014), Mercy (2014), Cell (2016), 11.22.63 (tv mini-series, 2016), The Dark Tower (2017), Gerald’s Game (2017), It (2017), The Mist (tv series, 2017), Mr. Mercedes (tv series, 2017– ), 1922 (2017), Castle Rock (tv series, 2018– ) and Pet Sematary (2019). Stephen King had also written a number of original screen works with Creepshow (1982), Golden Years (tv mini-series, 1991), Sleepwalkers (1992), Storm of the Century (tv mini-series, 1999), Rose Red (tv mini-series, 2002) and the tv series Kingdom Hospital (2004), as well as adapted his own works with the screenplays for Cat’s Eye, Silver Bullet, Pet Sematary, The Stand, The Shining, Desperation, Children of the Corn 2009, A Good Marriage and Cell. King also directed one film with Maximum Overdrive (1986). (Winner for Best Supporting Actor (John Turturro), Nominee for Best Musical Score at this site’s Best of 2004 Awards).